If you follow me on instagram you already saw a little preview of a room I've been working on. I'm using the hashtag #makingovermamashouse if you want to follow along. My mom wants me to help her makeover her new house, so we are slowly working on it room by room. We are trying to mainly use what she has to keep it budget friendly, but are mixing in a few new things too. She went on a short little trip last week and I seized the opportunity to get a head start on the playroom for the grandkids. Her only requests were gray walls (she already had the paint) and a birdcage light like I created for my daughter's nursery. The best part was she had no idea this whole makeover process was going on while she was away. Those are the best surprises. I love surprises. I could hardly stand waiting for her to get home. My dad helped me a ton with the painting and I couldn't have done it without him. He also helped wrangle my busy toddler while I finished up the other details. We are still far from finished, but I got a good head start on things. I'll share some more details of the room once it's complete, but I wanted to share a new gold spray paint I stumbled upon while working on a few projects. 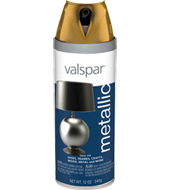 Lowe's was out of my usual fav, rustoleum gold metallic, so I just grabbed a can of Valspar gold spray paint. It turned out to be such a happy accident. 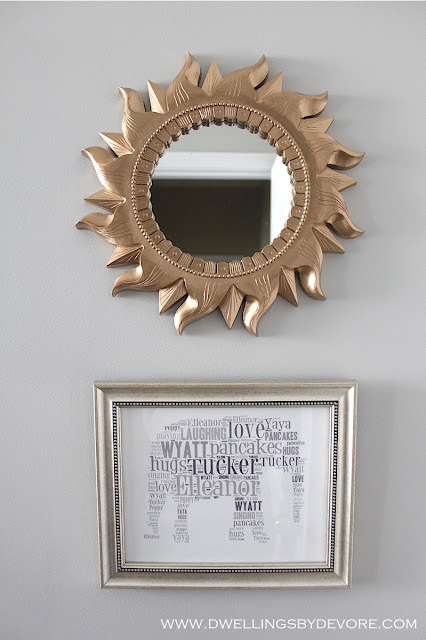 I'll probably still use the Rustoleum gold metallic (I still like it), but this gold had a little more bronzy undertones going on that I really liked. 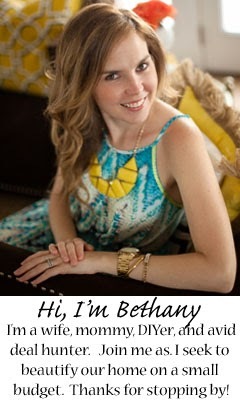 Here are a few projects I completed so you can get an idea of what it looks like. You can really see the color here, it's a little more brassy which I like and less bright and shiny. 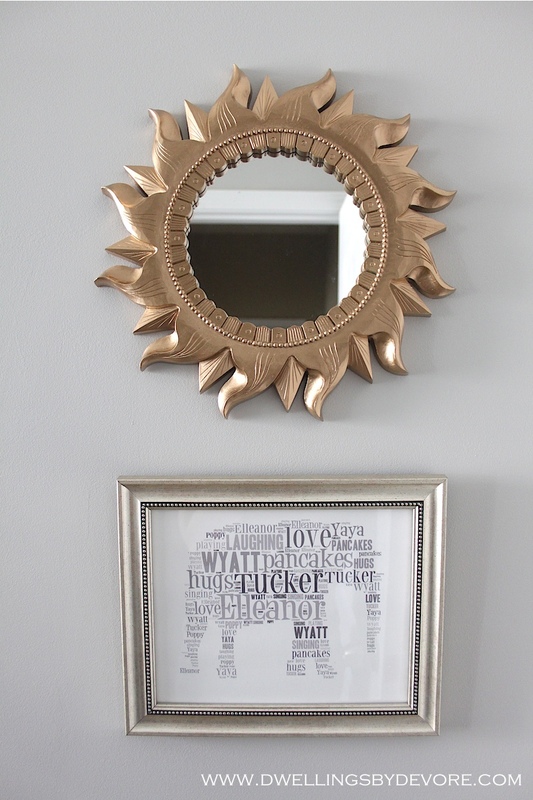 I also painted this thrifted mirror with it. If you love gold as much as I do you may want to try this one, it just might become your new favorite. 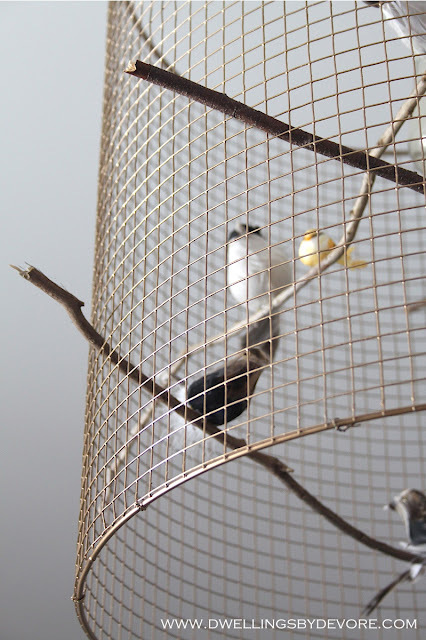 Also, if you want the deets on how I made the birdcage light check out my original post here. Love the birdcage light, such a pretty, whimsical piece! Another amazing project! 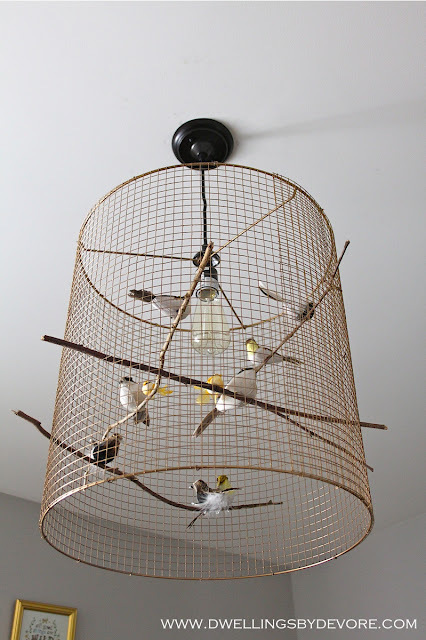 love everything and the bird cage is giving me an idea for an oversized lampshade that my hubby broke and I have no clue what to do with. The bird light is AMAZING!!! !